Compressor motors typically need cooling, often use a cooling fan, and over time, these compressor cooling fans can break. OK, you’ve got a broken compressor cooling fan, now what? An industrial air compressor will typically have a parts supply network allowing you to get a broad range of parts for their brand of compressors. On this page we’ll focus on the smaller, DIY type air compressors that are commonly available online and from the big box stores but outlets that don’t normally have parts for the compressors they sell. So, what do you do when your air compressor cooling fan gets old and brittle, and finally loses a blade, or just shatters into pieces? First off, if the fan is broken, and the compressor is still under warranty, get the supplier to fix or replace it. The advice on this page is for owners of air compressors with a broken compressor cooling fan, and that cannot rely on the supplier to fix the problem! The compressor cooling fan is typically located on the compressor motor shaft. The motor shaft rotates to drive the compressor pump and the fan, attached to the same shaft, either pulls or pushes cooler air over the motor to help reduce the motor temperature. The compressor cooling fan on your model of air compressor may not be visible, but rather be inside an overall motor housing which contains the motor, capacitors and fan. This style is known as TEFC, and acronym for totally enclosed fan cooled. A variety of styles of compressor cooling fans. Many of these fans are made of plastic. The plastic can get very brittle with age and the heat generated by the typical compressor. They then continue to undergo significant physical stress through the high RPM of the motor shaft, and the fans can break. If your compressor has a broken compressor cooling fan, you are not alone. The problem with this happening is that virtually, none of the traditional big box stores, the source for many DIY air compressors, carries this type of spare part. Here’s what you can do to get a new one. That you know you’ve got a broken compressor cooling fan indicates that you’ve already disassembled part of the compressor to the point where you can get at the fan. You will want to remove the remnants of the fan from the motor shaft, being careful to note how the fan core is attached to the compressor motor shaft. 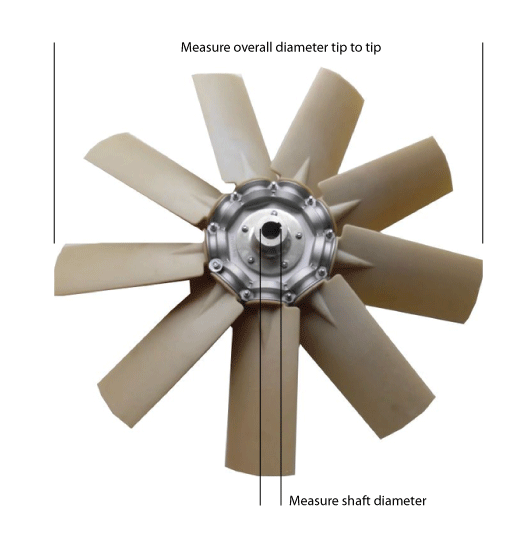 Be careful to maintain the fan core so that you can measure the diameter of the shaft hole. Again, note carefully how the fan is attached to the motor shaft. For example, the image below shows a fan that has a keyed-shaft mounting slot. Then, measure the O.D. of the fan blades, blade tip to blade tip across the center of the fan. You’ll want to match the O.D. of the fan and the shaft diameter. Just because the existing broken cooling fan is attached to the motor shaft with one method, does not mean that you have to attach the new fan the same way. Just as long as it’s a secure fit. It’s a bit more difficult if the old fan was a press fit. That being the case, try to find a replacement fan that has a set screw to attach the fan to the shaft. Cannot find the same style of fan? The engineers that designed the fan for that specific compressor motor may have had a specific design criteria in mind. Or, they simply went to a plastic fan manufacturer and acquired a fan that fit their housing. My point is, the fan is not rocket science, at least as it pertains to the application of cooling a motor. If you get one that’s close in terms of blade numbers and size, maybe a tiny bit smaller than the O.D. of the old fan, but no bigger, it will work just fine 99 times out of a hundred. And since the compressor is off warranty, is used sporadically, I think pretty much any fan would work, as long as it’s cooling the motor, and you aren’t over-using the compressor, duty cycle wise. No luck yet? Try Googling “plastic cooling fans for electric motors”. You’ll find lots. Use the same criteria to get one that suits your compressor. As it is true with almost anything consumer oriented from cars to compressors, having to rebuild a compressor by buying parts can get expensive. But, if the only issue with your compressor is a broken fan, you should be able to find a replacment and get your compressor running again for far less than buying a new compressor. Good luck in your compressor repair.